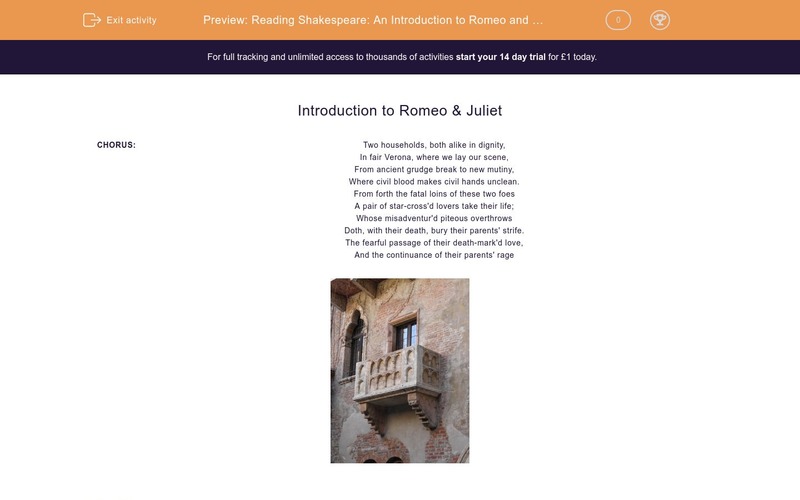 In this worksheet, students learn about the context, themes and plot of Shakespeare's play Romeo and Juliet. They will then answer questions about the way in which the story unfolds. Doth, with their death, bury their parents' strife. Romeo and Juliet was written in 1595 in the earlier part of Shakespeare's career. The prologue to the play tells us what it is about, and how it will end. The children of two enemy families in Verona fall in love, but are fated to take their own lives as they are caught up in murderous inter-household rivalry and misadventure which is brought to an end by their deaths. It may seem strange that we should hear the conclusion to the play at the beginning. One reason for this was that the story of Romeo and Juliet was already known to the educated in Shakespeare's audience. The most recent, prior version of the story was a popular poem from 1562 by Arthur Brooke, The Tragicall Historye of Romeus and Juliet, and several versions of the story existed before this. The lovers' defiance of their parents' wishes is treated differently in these various versions, but the plot is roughly similar. Shakespeare's contribution was to turn the tale into a drama, a performance on stage which condenses action that takes place over a much lengthier period into two hours. As the play unfolds, the prologue has made us fully aware of the hero and heroine's destinies and this increases the pathos felt by the audience as events are viewed. The play is set in Verona, in Italy, and in Mantua where Romeo is sent into exile. Italy was a romanticised place where it was believed that great feuds and love stories could occur, but the characters' beliefs and actions are those of sixteenth-century England. The Montagues and Capulets are at war for reasons we never discover. From the start of the play, the depth of the animosity is obvious. Romeo and Juliet's love is set against this background which determines that they will be "star-crossed lovers". Even for the Elizabethan era, Juliet at fourteen and Romeo at sixteen were young for marriage. Their young ages make them more vulnerable in the plot as they have to stand up to their parents and their social environment. Their age also adds to the sense of their love being true and pure against a background of conflict. During the early modern period, European rulers struggled to control the interactions of feuding nobles who historically were accustomed to using violence, rather than the law, to sort out their own disputes. The first scene opens with a street fight that shows the bitterness of the family feud between the Capulets and the Montagues. It is brought to an end by the intervention of the Prince, the authorised representative of the state and the symbol of true law and order, who ordains that future breaches will be punishable by death. The scene also establishes that Romeo is already suffering from unrequited love for Rosaline, and he is advised by his friend and confidant Benvolio to look elsewhere. Juliet's father Capulet is approached by Count Paris seeking her hand in marriage. Capulet feels his daughter is too young and initially suggests that they wait for two years, but then agrees to the proposal provided it is acceptable to Juliet. An illiterate servant delivering invitations to a Capulet masked ball reveals to Romeo that Rosaline will attend, and Romeo decides to do the same in the hope of seeing her. The audience is aware that Romeo and Juliet are likely to meet. Lady Capulet converses with Juliet about Paris' offer. She appears much more keen than her husband for her daughter to accept it. Juliet looks forward to the evening ahead. Romeo, Mercutio and the Montagues make their way to the ball. The character of Mercutio is portrayed as humourous and high-spirited. Romeo seems to have a premonition that something bad is about to happen to him. At the ball Romeo is instantly attracted to Juliet and they fall in love. Tybalt is enraged that the Montagues have intruded upon a family occasion and the strength of the family rivalry is evident. Romeo and Juliet realise they are from rival families. The prologue to Act II establishes that Romeo has forgotten Rosaline and is in love with Juliet. Romeo's friends are unable to find him after the ball. 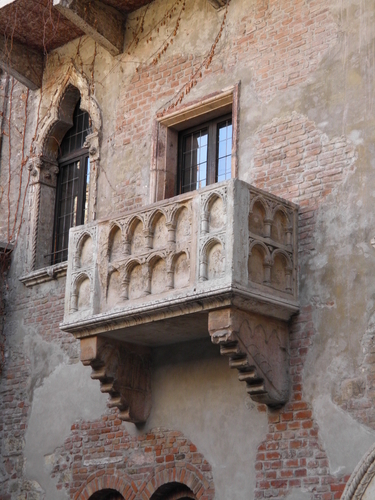 In the famous balcony scene, Romeo hears Juliet declare her love for him whilst waiting below in her garden. Romeo tells her he loves her and she asks that he makes arrangements for them to be married. Romeo asks Friar Lawrence to marry them and he agrees, believing this might reconcile the families. Tybalt sends a challenge to Romeo and Mercutio says that he will accept it if Romeo doesn't. The Nurse tells Romeo that Juliet wants him to arrange their marriage. The Nurse then passes on the details to Juliet: she is to go to Friar Lawrence's cell for the ceremony. The Friar lectures Romeo about his fickleness and reveals concerns about the suddenness of the couple's love, but they are married. Benvolio and Mercutio are in the street when they encounter Tybalt looking for Romeo. When Romeo arrives Tybalt insults him. Romeo tries to pacify him but Mercutio starts a fight with Tybalt and although Romeo tries to stop it, Mercutio is killed. Romeo fights with Tybalt to avenge Mercutio's death. Tybalt is killed and Romeo flees. The Prince sentences Romeo to immediate banishment. The Nurse reveals to Juliet that her husband is now her own cousin's killer and that he has been banished. Juliet is distraught and asks the Nurse to tell Romeo to come to her. The Friar tells Romeo that he has been banished by the Prince and Romeo is desolate. The Nurse knocks on the door and it is arranged for Romeo to spend the wedding night with Juliet before he goes into exile in Mantua. where he will wait until the social climate changes. Unaware of the secret marriage, the Capulets decide that Juliet must marry Paris within the next three days. Juliet's father has abandoned his earlier inclination to seek Juliet's consent, instructing Lady Capulet to tell Juliet that she is to be married. Romeo and Juliet part after one night together when the Nurse arrives with news that Lady Capulet is coming to see Juliet. Juliet refuses to marry Paris and her father threatens her with disinheritance. The Nurse tells her to forget Romeo, and Juliet decides to go to the Friar for help. Juliet produces a knife in front of the Friar. She is suicidal. The Friar seeks a solution. He produces a vial containing a drug that will make Juliet appear dead for two days. The Friar will send a message to Romeo to come and rescue her when she wakes up. Juliet tells her delighted father that she will marry Paris. He brings the wedding forward by a day and stays up all night organising it to ensure it is a success. The night before the wedding Juliet refuses to allow the Nurse to stay with her. Left alone, she drinks the potion. Whilst the Capulets make final wedding preparations, the Nurse is sent to rouse Juliet. Juliet is apparently dead and her parents are stricken with grief. The Friar and Paris arrive, and the wedding becomes a funeral as the Friar organises the burial. In Mantua, Balthasar reaches Romeo before the Friar's messenger and tells him she is dead. Romeo visits an apothecary to buy a deadly poison so that he can "lie with Juliet tonight". Friar Lawrence is made aware that the letter to Romeo has not been delivered. He goes to the Capulet crypt to be with Juliet when she wakes up. At the Capulet vault, Paris keeps watch. As Romeo and Balthasar approach, he hides. Romeo breaks in to the vault and is then challenged by Paris. Paris is killed. Romeo looks at Juliet's corpse then takes the poison. Friar Lawrence arrives and meets Balthasar as Juliet begins to wake up, but runs away at the sound of other people approaching. Juliet stares at her dead husband, then stabs herself with his dagger. The Friar gives a speech as an explanation for the events. The Prince accepts it and reads a letter from Romeo to his father. He condemns the feuding families for their violent quarrels, and the Montagues and Capulets are reconciled. The major theme of the play is love in adversity. The bitterness of the feud between the Montagues and Capulets is emphasised on many occasions. The play opens with a street brawl in which the aggression of Tybalt is established as he challenges Benvolio with "Have at thee, coward!" We also learn of the order of the state, represented by the Prince, that the violence must stop. Tybalt is enraged when a Montague attends a Capulet ball, but in spite of the conflict Romeo, a Montague, and Juliet, a Capulet, fall in love. The other factor that contributes towards the "star-crossed" nature of their love is the determination of Juliet's father to marry her to Paris in an age when children were expected to obey their parents. Romeo is drawn in to the climax of the feud and kills Juliet's cousin Tybalt whilst secretly married to her. His banishment separates them whilst Juliet's parents arrange a hasty marriage to Paris. The Friar's plan gives us hope that there can still be a happy ending, but fate causes it to go wrong. Romeo shows his full commitment to Juliet by killing himself so that he can be with her forever. The Montagues and the Capulets are then reconciled. Now answer the questions on the play. You can refer back to this page at any time by pressing the Help button. Describe two different aspects of the play's setting. What does the prologue to Act One tell us? What dramatic effect does the information contained in the Prologue have as the play progresses? What does the first scene, in which there is a street fight, establish? What two significant developments occur at the masked ball? What do Romeo and Juliet do after the ball? What two developments then threaten the lovers? What is the Friar's solution? How does it go wrong? What happens in the crypt? What happens at the end of the play?